Setting dogma aside, the Church of Rome was wide open for attack by the Reformers. In Scotland Knox raised his voice in Perth 11 May 1559, against the Grey and the Black Friars – the Order of Friar Preachers. 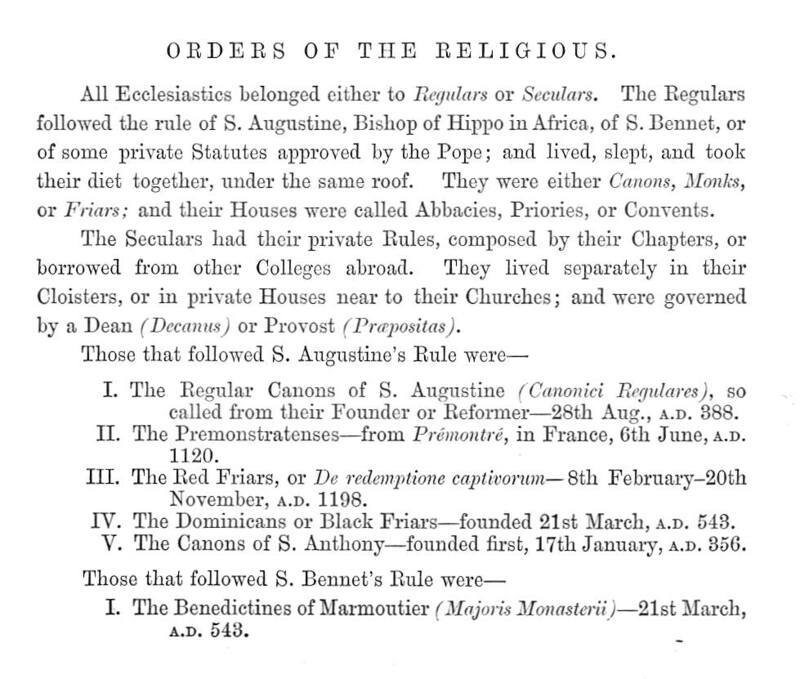 There were, however, many other groups of both lay and clerical fraternities, each working to its own set of rules or `Orders` approved by the Pope. The true monks, or monochoi, were those who sought a spiritual betterment and seclusion for their study and contemplation. Others sought to gain the hearts and minds of the people by working among them, preaching in pairs sometimes from a portable altar, in the local vernacular (not Latin), and usually living in humility and penury. The Grey and Black Friars were the mendicant Orders because they were enjoined to exhibit a perfect way of life, by living in poverty and submitting to all hardships; to work when they could find employment, and when not occupied thus they were allowed to beg. The Grey Friars were the devotees of St Francis of Assisi, son of a merchant of Assissi in Umbria. History has tended to see him as a kind hearted young man with `a heart overflowing with compassion` for his fellow man, who particularly loved animals. He had however, led a tempestous and debauched youth. His conversion to a more staid way occurred in 1208 when he heard a sermon on Matthew x, 9-10 “provide neither gold nor silver .” which convinced him that absolute poverty was the essence of the Gospel. His new Order was patronised by Pope Innocent III and afterwards endorsed and approved by Honorius III in 1223 AD. 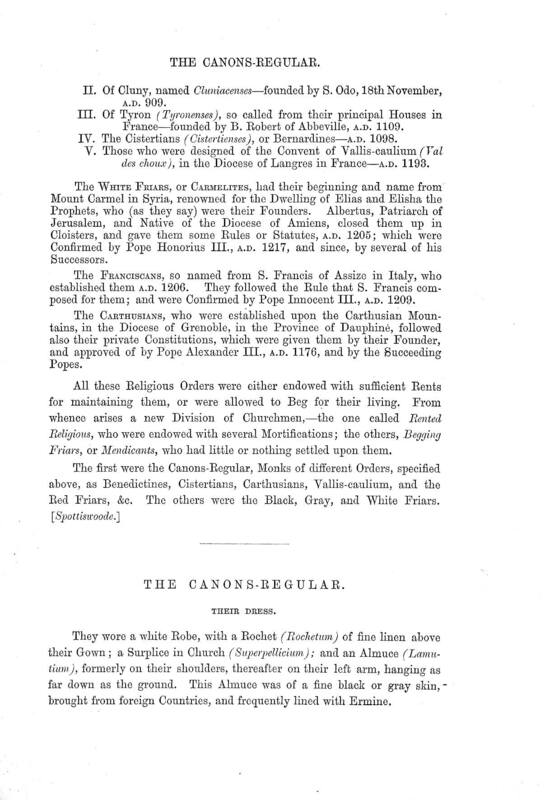 He disliked the term `friars` from the French frere, brother (of mankind) and preferred them to be known as `Fraterculi` or `Little Friars` or Friars Minor by which denomination they are still known. They appeared in England in the reign of Henry III and first established in Canterbury in AD 1224. In Scotland they had their friary in what is now the Greyfriars Kirkyard, Edinburgh, dating from the 15th century until 1558. In 1562 the Town Council was allowed by Mary Queen of Scots to take over the grounds for a burial yard. The Grey Friars in particular were referred to as “friends or fathers of the poor” and so highly respected that they were accorded a place in the marriage procession of James IV and Margaret Tudor in 1503. As late as 1531 James V wrote to the Pope declaring “We do not think it outwith our duty to be the Guardian, and Protector of that Order.” This followed the example set by King David II who issued a Letter of Protection for all the Preaching Friars in Scotland on 14 April 1357. The Presbyterian Greyfriars Church stemmed from a decision of the Town Council in 1601. In a small touch of irony, in the following year the Council ordered the use of the stones from the ruined convent of the Sisters of Siena to be used in its construction. The Greyfriars Church opened on Christmas Day 1620. At the dissolution of the monasteries they had fifty five houses in England. The Black Friars were adherents of St Dominic, an intellectual, professional cleric, and said to have been a brilliant preacher. St Dominic was a Spaniard by birth and from the influential Guzman family. He was also a fiery and impetuous individual who discontented with attacks on the church was responsible for the assault on the Waldenses (a sect founded by Peter Waldo in 1114 AD that denounced the Church of Rome who were driven into the valleys of Piedmont, south of Turin). Benedict was responsible for the infamous `Inquisition`. its form came from this violent and sanguinary man. Received in great favour by Pope Innocence III he was permitted to set up his own Order with the first objective to extirpate heresy. His Rule was initially that of St Augustine but he added severe and austere variations including the occasional abstinence from drink for up to eight days. He afterwards changed the discipline from that of the canons to that of monks, and required his followers to take a vow of absolute poverty and abandon all their income and possessions. They first established a house in Oxford in 1221 AD and soon after in London. In 1276 the Mayor and aldermen of London gave them two whole streets beside the river Thames which bears the name Blackfriars. At the dissolution they had forty three houses. The arrival of the Black Friars in Scotland was from England (Friar Gilbert in London,1221) via Berwick on Tweed where they had a friary in 1230 AD. In the same year they were granted by Charter a royal house and adjoining land south of the Cowgate, Edinburgh which became their centre for Scotland. These premises continued in royal use for lodging the king as well as for royal functions, until Holyrood Palace became available. King Alexander II also made available a contribution of ten merks from the taxes on Edinburgh, while the Town itself donated annually six barrels of sowens beer ( a weak concoction of sour beer and oatmeal shavings popular among the poor) in recognition of their good works. In many ways the two founders, were like chalk and cheese, one an enthusiastic amateur, the latter an intellectual professional who oversaw the educational and religious qualification of his followers. In common their followers preached in the streets and the fields to the masses, seeking their redemption and protecting them from the alleged heresy propounded by the Reformers . They both relied on the voluntary alms for their sustenance and because of this they were labelled mendicant or begging friars. But both Orders courted the rich rather than the poor, and were most assiduous in their attention to people of influence. So successful were they that they even gained admittance to the king of whom they unremittingly asked for greater privileges. Neither Order did itself any good by arguing with other Orders, and generally competing between themselves for position, status and privileges. An example of the extent of the internecine wars concerns the argument of the Immaculate Conception. Four Dominican friars in Berne devised a replica of the Virgin Mary that could move its limbs, cry, make responses etc ( a ventriloquist`s dummy as near as makes no difference). They used this doll to press their arguments to the people ( who had seen nothing like it before and were easily convinced of a miracle) and to feign apparitions of St Mary, St Barbara, and St Katharine. They were eventually discovered and exposed as fraudsters by watching Franciscan friars and promptly executed at the stake in 1509 AD. It was aspect of their life like this, that was visible and tended to be emphasised as derogatory and wayward. As allegedly learned and devoted men, their priories were decorated with devotional symbols; the Black Friars especially were renowned for having some gifted artists, designers and decorators. The rich Catholic symbolism, statues, decorations and the like, fed the wrath of the Calvinist Reformation and the multitude who ransacked the properties. An Excellent source for the Blackfriars of Edinburgh,by W Moir Bryce, is in The Book of the Old Edinburgh Club, Vol III, p 13 et seq.